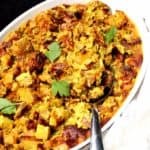 This Cheesy Vegan Breakfast Potato Casserole studded with crunchy golden spuds and chewy vegan sausage, all in a creamy, cheesy cashew sauce, delivers plenty of flavor and nutrition to get your weekend off to a great start. You can make this healthy and delicious — and easy — recipe ahead of time and pop it into the oven 30 minutes before serving. 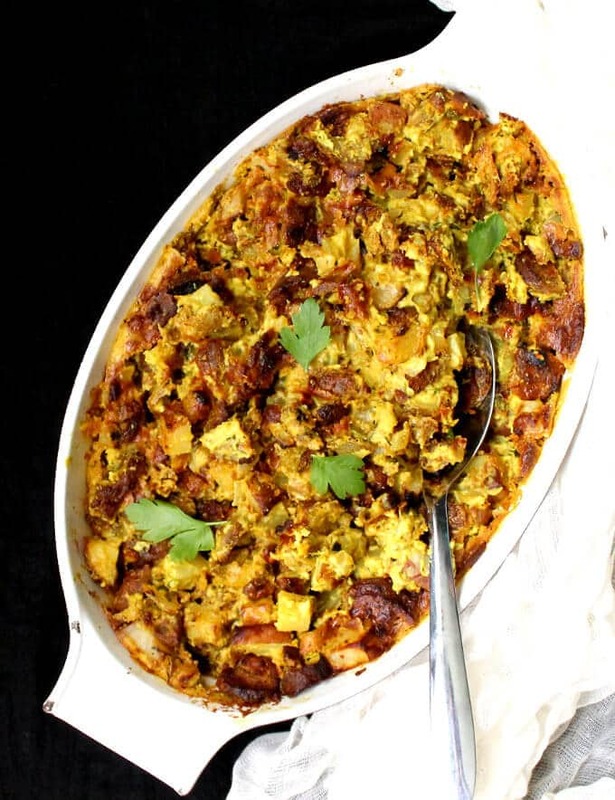 A savory breakfast like this Cheesy Vegan Breakfast Potato Casserole gets me out of bed and raring to go even on a Saturday morning. Which gives you an idea of just how delicious it is, because I’m the gal that hits the snooze button five times before I can open an eyelid. 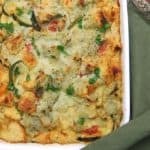 What makes this a healthy vegan breakfast casserole is the delicious ingredient list, made mostly of staple pantry ingredients. It’s a breeze, really. 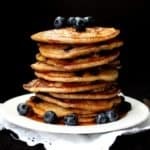 I like making weekend breakfasts that are really nutritious, because mornings can sometimes get a little crazy, which means lunch can be rather late. A healthy, solid breakfast like this will sustain you for hours, and take away any need for snacking. You add in lots of healthy stuff that pack in a maximum of nutrients. Potatoes, onions, and vegan sausage add healthy carbs and protein. Make sure you pick an Italian vegan sausage for the best flavor. 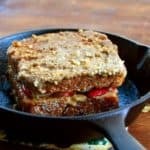 I use Field Roast or Tofurky, and both work really well here. Make sure you slice them thinly or crumble them up — a food processor works fine for this. You could go with Gimme Lean, although I do not find it as flavorful for this recipe. If it’s all you can find, though, use it by all means. There’s so much deliciousness in this dish even if you’re not a savory breakfast person, even if you’re not a potato person, and even if you can resist golden, crunchy food (What? Honestly? You exist?). You will still find something to love here. Perhaps it will be the delicious chunks of sausage flavored lightly with herbs and garlic. Or the creamy, cheesy cashew sauce with turmeric, so good that you’ll probably start eating it out of the blender. My favorite part about this breakfast is the ease of making it. Prep work is minimal, chop an onion, a couple of cloves of garlic, and crumble or slice some vegan sausage. Oh, and you do have to press the button on a blender. I love getting the potato-sausage mixture and the cheesy sauce ready ahead of time– usually the night before– so I can just bung the casserole into the oven in the morning. The delicious smell wafts across the house, waking any last remaining sleepyheads and bringing them, magnet-like, into the kitchen. 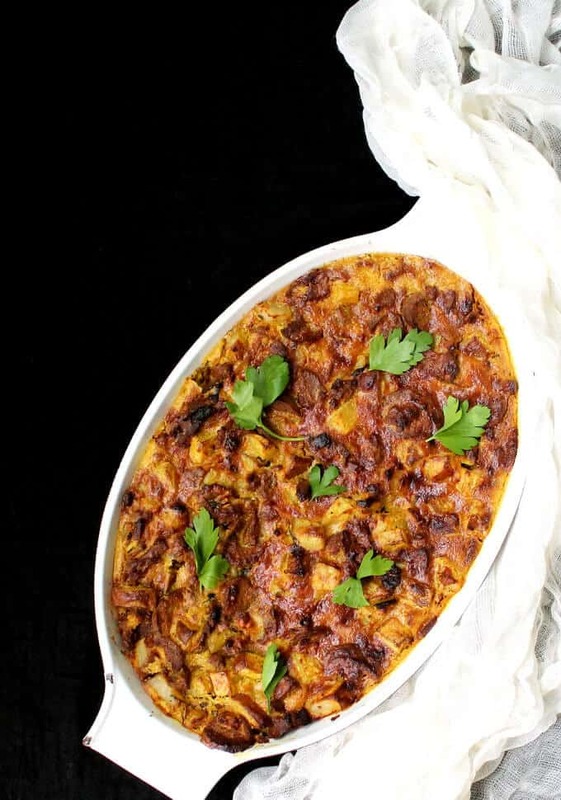 If you make this Cheesy Vegan Breakfast Casserole, be sure to come back and tell me about it. Or take a photo, post it on Instagram and tag it @holycowvegan. I wanna hear! 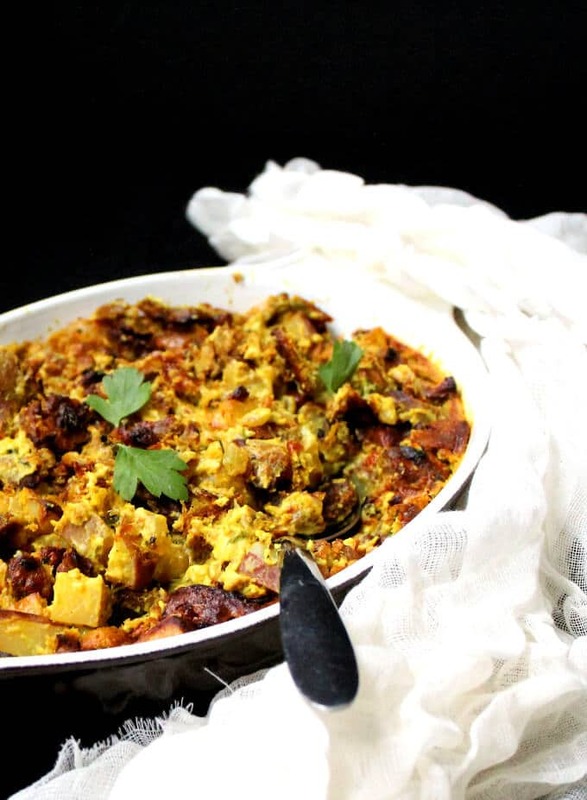 This Cheesy Vegan Breakfast Potato Casserole studded with crunchy golden spuds and chewy vegan sausage, all in a creamy, cheesy cashew sauce, delivers plenty of flavor and nutrition to get your weekend off to a great start. You can make this recipe ahead of time and pop it into the oven 30 minutes before serving. Make the cheesy sauce by combining all ingredients and blending into a really smooth paste. Set aside. Place the diced potatoes in a microwave-safe dish and add 1 tbsp water. Cover and nuke on high for five minutes or until potatoes are tender. In a large skillet, heat the oil. 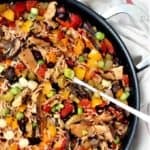 You can do this in a 10-inch cast-iron skillet or any skillet that can go from the stove to the oven, to reduce cleanup. Add the onions, garlic and parsley to the oil. Season with salt and ground black pepper and saute, stirring, for five minutes over medium heat or until the onions are soft. Add the sausage and potatoes and continue to cook, about five minutes. Check seasoning and add more pepper and salt if needed. 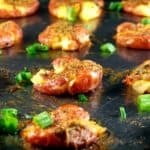 If you are using a cast iron or a stove-to-oven skillet, arrange the potato mixture in an even layer and pour the cheesy sauce over it evenly. If using a baking dish, like I did, transfer the potato sausage mixture to the baking dish and pour the cheesy sauce on top. Transfer the skillet or baking dish to the oven and bake 30 minutes or until the top starts to lightly brown. Switch to the broil function on your oven and broil for another five minutes on the highest setting, or until gold-brown spots appear on the potatoes and cheesy sauce. Remove from the oven, garnish with more parsley if you wish, and serve hot or at room temperature. You can make the cheesy sauce and the potato-sausage mixture the previous night. Mix them in the baking dish in the morning and proceed to bake. 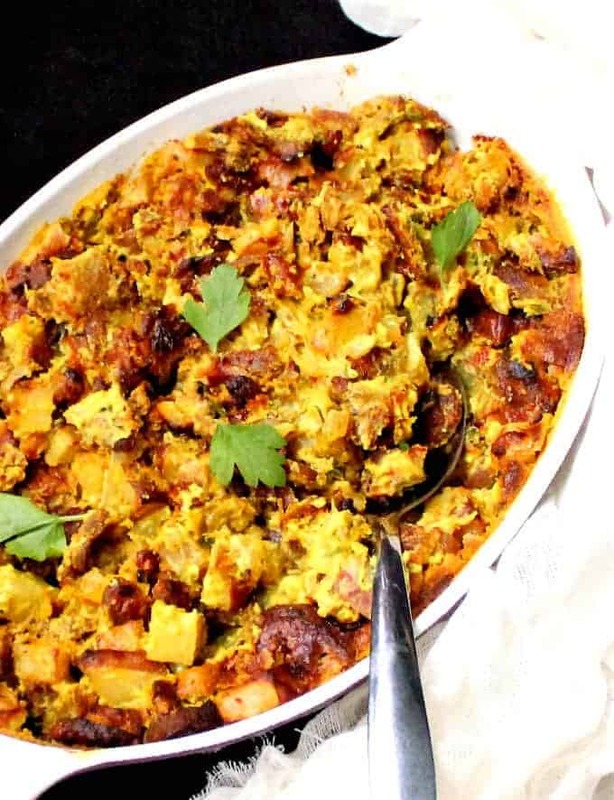 Where is the cheese in the “cheesy “vegan breakfast casserole? You’re probably unfamiliar with vegan food. There can be no real cheese in this because it’s a vegan recipe, meaning it’s dairy free, but the cashew sauce is very cheesy with the yeast and other ingredients. 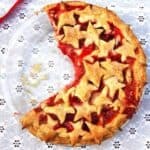 I am making this for breakfast tomorrow, can’t wait. I love the sound of that sauce. Your magic cheesy sauce is one of our favorites. For the cheesy sauce do you use the water that the cashews are soaked in or do you strain them first? You can use the soaking liquid! Trying this this morning, and so far so good. 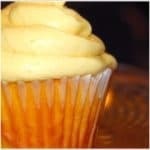 I also wasn’t sure whether to include the soaking liquid based on the instructions (when I did it came out thin? ), and didn’t see an instruction for which size baking dish to use. Those two clarifications would be helpful. I didn’t have any Italian sausage, so I had to substitute apple sage sausage. I think it’ll still be fantastic. Eagerly waiting for it to come out of the oven. Thanks for the recipe! THIS WAS SO GOOD!!! We needed a vegan alternative to our traditional Christmas egg casserole and this came up in a search. We all loved it– vegans, vegetarians and carnivores. We used Hillary breakfast sausages and made it the day before. It looked like it had soaked up the “cheese” sauce and would be dry but wasn’t at all after baking. Several of us added hot sauce to it upon serving and the youngest teen ate it as made. Super new dish for us to have for dinner, Christmas, breakfast, whatever. And one I can take to the carnivore extended family gatherings if doubled or tripled. Thank you!! Holy cow is right! This is SO freaking good! I only had 2 sausages on hand, so I added some Lightlife bacon. I also threw in a few handfuls of baby spinach and kale. I wasn’t sure about draining the water from the cashews or not, so I did. Then, I ended up adding some unsweetened almond milk to the cheesy sauce. This was eggy and savory and awesome! Thank you! 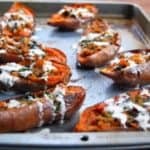 I’d love to use sweet potatoes instead of regular potatoes. Would I cook them the same way? Yes lower the microwave time a bit if needed! Ohhh my… I love what you started here. I have a problem with taking a recipe like this and then added my own twists … I could list them all but… Then it’s a whole other recipe now isn’t it? This is great! Thank you so much for adding a new bit of excitement to my morning meals… Yummmmy! Already shared it with some friends! Just wondering if it would be possible to substitute a vegan cheese instead of making the cashew cheese for my daughter who has a tree nut allergy? Yes add the vegan cheese over the potatoes. Your casserole might be a bit dry though so for a better texture combine a cup of any nondairy milk with the other ingredients in the cheesy sauce except the cashews and water and pour over the potatoes before adding the cheese. Sounds great & easy! Can I use tahini instead of the soaked cashews? What quantity? Can this recipe be made in advance, then freeze, thaw and cook? I’m wanting an easy Christmas morning option to just pop in the oven. Thanks! Amazing!! I took it to work for a staff pot luck!this will be a go-to for me. Thank you! 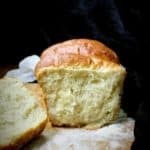 Hi, thank you very much for sharing this recipe. It was great! My whole family enjoyed it this morning. In fact, I was very pleasantly surprised that the five of us (ranging from whole food/Vegan to carnivore) finished off the entire thing. Thanks again! In the write up about the cashew sauce you mentioned turmeric but it is not in the list of ingredients for the casserole. How much turmeric did you use. 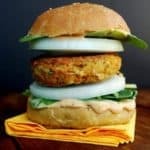 I want to make this Friday for our daughter and family who are coming to visit and are Vegan.